Help! 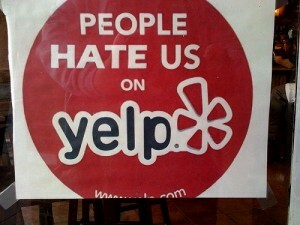 How to handle a negative review on Yelp! Being a Virtual Assistant who specializes in social media, I have gotten some strange requests from people. Business owners often contact me wanting to know how to take down a bad review on Yelp! about their business or service. More than once I have had business owner’s ask if they can hire (pay) me to write fake positive reviews for their business. Them: But I have a negative review on Yelp! and it is going to hurt my business. My suggestion: Usually negative reviews are there for a reason: either the reviewer or your staff may have been having a bad day and things just did not go right. If you have many negative reviews, you may want to read the reviews and see if you find a common complaint and then take a good look at your business practices and see if any changes can be made to improve customer satisfaction. Respond to the negative review as soon as possible. Apologize to the disgruntled customer and do what you can to remedy the situation. Other customers will see your response and will appreciate that you took ownership. The best way to get rid of negative reviews is to offer awesome service and fill your review page with legitimate happy customers writing positive reviews so that one negative one gets bumped down in importance. If a customer is raving about your business you can politely ask them to write a review on Yelp! Tip # 10: Don’t be afraid to address negative reviews online. Use them as an opportunity to show you care about your customers. Very timely post given the number of sites where anyone can leave reviews of practically everything! Great post – love the positive way to respond to the negative.